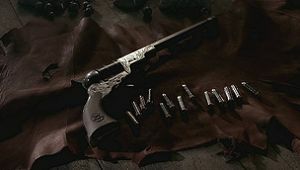 This category contains all the weapons and mystical objects used in Supernatural, from hex bags and holy oil to the Colt. Note that only physical objects are included in this section. Powerful symbols, spells and exorcisms can be found instead in the Symbols & Rituals section of the wiki's library. The Winchesters's personal Weapons Catalogue. A guide to gun models featured in Supernatural on the Internet Movie Firearms Database. Pages in category "Weapons & Mystical Artifacts"
Media in category "Weapons & Mystical Artifacts"
This page was last edited on 26 April 2016, at 01:52.